A set of three top dish towels that are so pretty and of such fine quality that they could easily pass for guest hand towels! 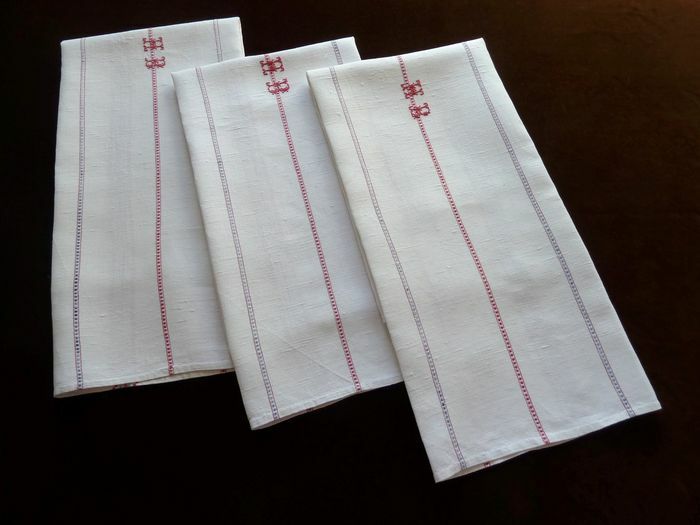 This lovely set is loomed of a slightly slubby though fine "fil de lin" eggshell white linen and were probably intended in their time to be used as glass towels, for drying fine crystal or silver. Each towel has thin alternating red-checked and blue checked stripes running lengthwise and wider checked bands that run along either side. A central monogram, "HB," is embroidered in fine red cross stitch and the hems are all hand sewn with miniscule stitches. Likely dating from the turn of the 20th century, these towels are in impeccable condition! Two additional sets of three towels are available upon demand. Dimensions: 31.5 x 26.5in.